As a young bachelor, I wasn't much into eating cheese by itself. It just never appealed to me. I was fine with cheese on sandwiches, pasta, pizza, and other stuff—you know, the usual suspects. But as a married man, I've learned to live with a woman who almost always has cheese on hand in our fridge—and not just slices of cheese or shredded cheese, but variants of cheese that were designed to be eaten as stand-alone snacks: those little wheels of Babybel, for example and, of course, various brands of string cheese like Frigo or Polly-O. At this point, I should pause and clarify something that most of you probably realize already: this is not string cheese. Foodie-hack that I am, I tore into one thinking it was. As I removed the entire plastic sleeve, I wondered why there was so much liquid surrounding the cheese, now spilling out of the packaging and onto my pants and the floor. Then I proceeded to grip the top of the cheese stick and pull down in a peeling motion. Not only did the cheese not peel as anticipated, but a little disc of it wanted to separate from the top in an unexpected way. I popped the little piece into my mouth and immediately realized: this product isn't like other cheap sticks of string cheese that kids constantly crave. This product is far more akin to those expensive mozzarella balls that cost something like $6 or $7 at the supermarket—the kind that's simple, subtle, and super gourmet. 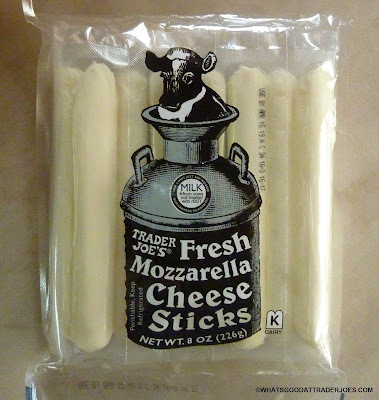 Indeed, these are quality mozzarella balls in stick form. They're cheese sticks for a more refined palate. I'm not saying your kids won't like them. I'm just saying that if they do, they've got refined tastes. 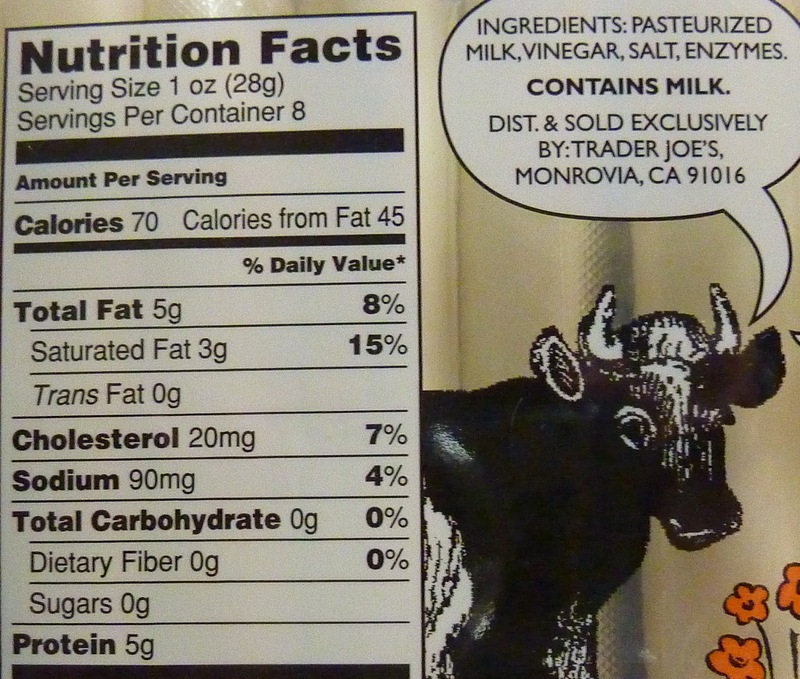 I've had some top-shelf mozzarella at county fairs and arts festivals, and for $4 at Trader Joe's, this product isn't a far cry from those other upscale offerings. It's a clean, light, milky flavor that will be perfect for warmer weather. These sticks aren't heavy, gooey, or overpowering in any way. They're super soft, too. There are delightfully few ingredients. I could see them working well in antipasto, or pairing with olives, tomatoes, bruschetta, or any other Italian foods with subtle flavors, but I must admit they make pretty satisfying snacks just by themselves. Sonia's a bit more of a cheese connoisseur than I am, and she enjoys these even more than I do. If you like the subtle flavors of fresh mozzarella and ever wanted to enjoy them in a convenient, snackable form, this isn't a bad purchase at all. Four and a half stars from my better half. Three and a half stars from me. There are definitely a lot of kids out there with this in their lunchbox wondering how mom bought the weird kind that isn’t fun at all. I love these and bring them to work with grapes and the sesame honey almonds as a modified, travel friendly cheese plate!